My daughter couldn’t decide what she wanted to be this Halloween until one day I was eating peas in pasta at a restaurant and an idea came to me. 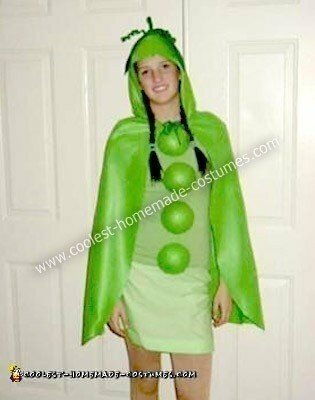 I researched how to make a good Homemade Sweet Pea Costume online but I couldn’t find very much so had to come up with this costume on my own. For this costume I made a green skirt and bought a green shirt. I cut Styrofoam balls in half, covered them with green felt and then attached them to the shirt with fabric glue. I made the cape with a hood out of soft,green, thin felt as well. On the top I attached a curly stem and leaf with a pipe cleaner. This is one of the best costumes I have ever made for my daughter and I was proud to see her wear it on Halloween and get tons of compliments from every house. At school she won the best costume and she was so happy. how did u make the hood stay op? a certain pattern for the cape?